Where competitors products are often made of plastic and/or only lightly enclose an iPad the TS600 provides a close to fully enclosed iPad stand that combines the aesthetics that iPad users expect with a robust and long lasting metal design all at a cost effective price point. 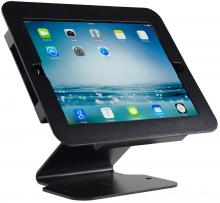 It also provides the ability to screw down the stand onto a counter for security (note screws not included). This model supports the iPad Air 1 2 and Pro 9.7".